← Say It Isn’t SNOW! I was recovering from my last round of chemotherapy. My hair was starting to grow back, but I was still weak from my recent battle with breast cancer. I had just stepped out of a shower and slowly starting my day when my husband called me from work and told me to turn on the T.V. telling me that there was a catastrophic plane crash in New York City. I tuned in just in time to see the second plane careen into the World Trade Centre. It’s one of those scenes you never forget in your lifetime. On Sept. 11, 2001 terrorists hijacked four passenger jets, each carrying tanks full of fuel and large numbers of travelers enroute to various destinations in the U.S. The hijackers commandeered the planes and deliberately flew to U.S. landmarks where catastrophic destruction was achieved: The World Trade Centre in NYC and the Pentagon in Arlington, Virginia. The fourth plane crashed in a field in Pennsylvania, just north of Camp David, the Presidential Retreat in Maryland. Their efforts to destroy yet another U.S. landmark that day was thwarted by the heroic passengers on that plane. Thousands of people were killed; property damage estimated in the billions of dollars, and yet, the world remembers today the countless acts of heroism and bravery by ordinary people who exemplified the human spirit and did extraordinary things! As a Canadian watching the drama unfold, I was overcome with emotion for my brothers and sisters in the U.S. Words cannot adequately describe the shock and horror I felt on their behalf. Later that afternoon, I gathered with many of my American friends who live and work here in Cochrane. We met at our church and we wept and prayed, clinging to one another, drawn together in mutual grief over the tragic events of that day. Across the street from Ground Zero stands St. Paul’s Chapel. It is one of the oldest churches in NYC. Though situated directly across the street from the World Trade Centre, St.Paul’s Chapel miraculously sustained little damage. The massive Sycamore trees, hundreds of years old, took most of the impact and shielded the tiny building from the flying debris when the Twin Towers collapsed. As a result, not a single pane of the precious stained glass was broken. 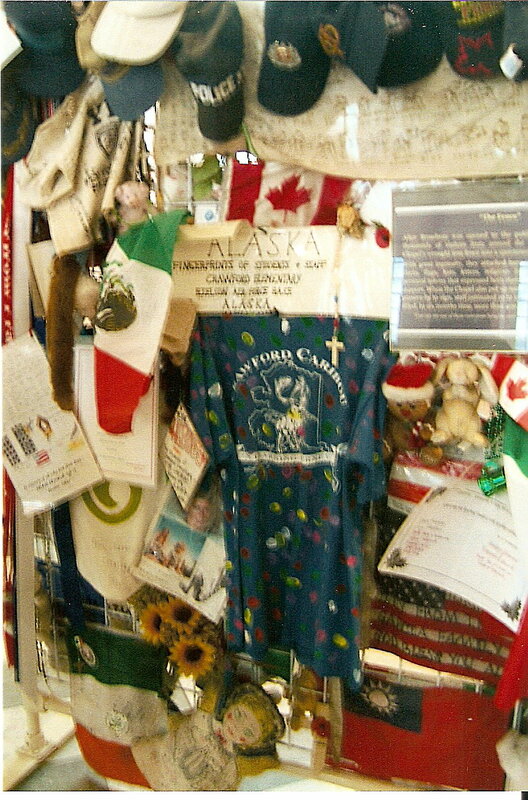 Days after the tragic events of Sept. 11, 2001, families of the victims came to the church to grieve and receive comfort while they awaited news of loved ones who were missing or searching under the rubble of the World Trade Centre. Later they put up memorials in tribute to those who lost their lives that day. Each memorial has been left standing and lovingly maintained by the church, and the small congregation now serves and ministers to those families who suffered such loss on that fateful day. Tributes were also sent from around the world for all the brave firefighters, police, port authority personnel and rescue teams who risked their own lives to save those trapped after the initial attack. Unfortunately many of the numbered dead are those men and women who responded first to the emergency. As my husband and I silently, reverently, passed by each display of tribute to those lost on Sept. 11, 2001, I was once again overwhelmed with emotion. Looking towards Ground Zero from St. Paul’s Chapel. 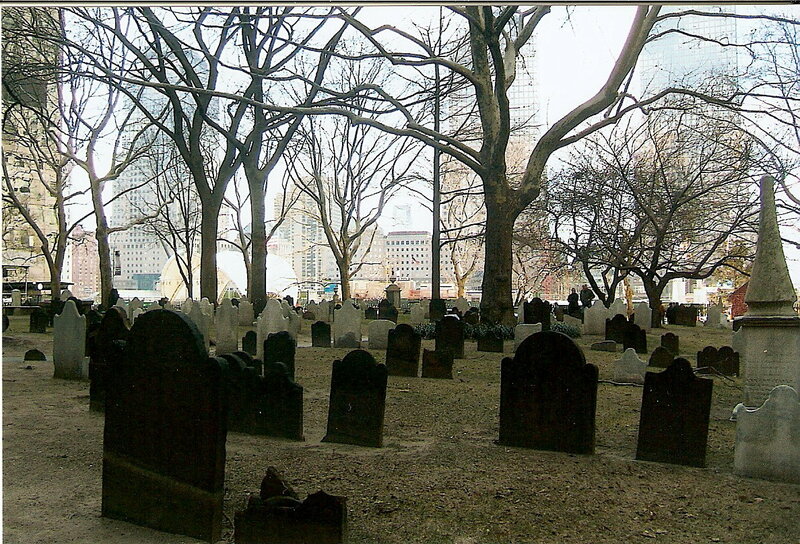 Take note of the blackened headstones as a result of 9/11 and a few of the Sycamore trees that protected the church that day. “Trees of Righteousness”… may it always be so! This entry was posted in Inspiration & Devotion, Proverbs 16:9 - Journey Thoughts and tagged #NeverForget, 911, History, Life, New York City, Sept. 11, St.Paul's Chapel, Twin Towers, World Trade Centre. Bookmark the permalink. What beautiful thoughts, Lynn! I tweeted it so others can see. Thank you for sharing it — and for letting me know on my journal. I didn’t realize that you are also a cancer survivor. Blessings and prayers are with you, my dear friend and sister! 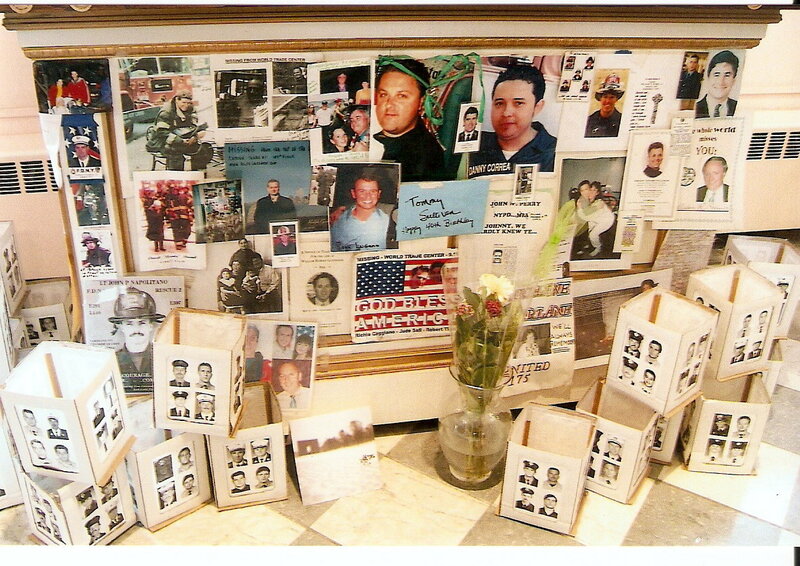 My husband and I also had the opportunity to visit Ground Zero about six years ago. It absolutely took my breath away as I felt the solemnity and devastation of what had taken place. There was an inexplicable kind of silence…almost eerie as we tried to phantom what we saw and to show respect for those who died that tragic day. I will never forget it. Praise God for the immeasurable blessing of His Word. Thank you dear, Christine for reminding me of this powerful verse!